This factory was located on the top three floors of a 10 story building in New York City. Workers would often smoke cigarettes during the day and toss the butts into buckets of leftover fabric. These workers were also locked inside the building during the workday and were forced to leave in single file lines in order to avoid any theft. When a fire broke out on the eighth floor, there was a mass panic. Many people made it to the roof and successfully escaped, but 146 employees lost their lives in that fire. Because of this fire, 36 new laws were put in place in New York to prevent that sort of disaster from happening again. This included hiring an inspector to ensure that no businesses locked their employees inside during the day and that there were overhead sprinklers in case of an emergency. In what can only be described as an accident waiting to happen, the Ringling Brothers Barnum & Bailey Circus came to Hartford, CT and set up a tent that had been waterproofed with paraffin and gasoline to keep out any rain. All the wooden chairs were painted with oil-based paint, and the entrances were narrow with metal railings to prevent people from sneaking in without paying. The fire started small, most likely from a discarded cigarette, and a few people saw it. However, they wrongfully assumed that the staff was already taking care of it. Once people saw it, it was too late. Even though everyone ran towards the exits, 168 people died. After that disaster, most circuses stopped using tents and set up their circus acts in existing arenas. Our Lady of the Angels was a private school in Chicago. Since it was a private school and not a public one, they were not required to adhere to the same fire standards as other schools. The stairs, equipment, and doors were all made from wood, with all fire extinguishers being placed up about seven feet off the ground – much too high for most adults to reach. The fire started from arson, and 92 children and three nuns passed away in the fire. Because of this fire, all fire safety rules applied to each and every school – not just public ones. Mandatory fire drills were put in place, and all schools’ fire alarm systems were required to be connected to the closest fire station. 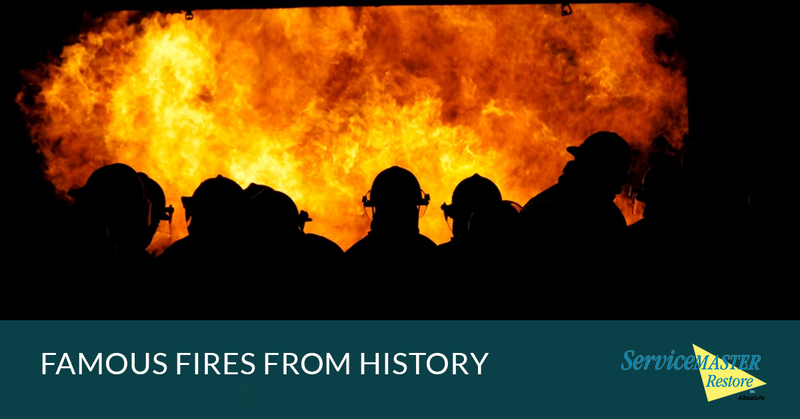 We sincerely hope that the fire your business experienced was not even close to as severe as these fires! When it comes to getting rid of the smoke, soot, and damage that the fire left behind, there is no better team to call than the professionals from SM Absolute. We do our best to restore your property to the way it was before so you can get back to business as usual. Don’t let a fire keep you and your employees from getting your work done! Contact us today to learn more about our services and how we may be able to help you.